JEE Main 2019 Answer Key, Responses & Question Papers has been released officially. The examination is conducted twice in a year by NTA. JEE Main-2 examination was conducted during 7th – 12th April 2019. It is a national level entrance examination. NTA organizes it to offer admission to B.E/B.Tech and B.Arch/B.Plan courses. NITs, CFTIs and various other colleges and institutions of India consider the JEE Main scores for providing admission. For admission in IITs & ISM Dhanbad, students have to qualify both examinations, i.e. JEE Main and JEE Advanced. JEE Main 2019 Result is declaring by 30th April 2019.Check JEE Main 2019 latest news about answer key, result, dates, cut off, counselling etc. JEE Main 2019 Result for April exam is declaring by 30th April 2019.Check here for result details. JEE Main 2019 Answer Key, Responses & Question Papers for April exam has been released officially. Candidates can submit their objections till 16th April 2019. Check here for answer key details. From the year 2019, JEE Main 2019 examination is conducted in online mode (computer based exam) by NTA (National Testing Agency) twice in a year – News Confirmed. Check here for details. After the few days of completion of examination, the answer key is published through the website. It has been released within a week after the examination by coaching institutions. The official answer key has been released on 14th April 2019. JEE Main answer key has been released through online mode. If candidates are not satisfied with any answer of the answer key they can also challenge it. Candidates have to fill an online application and have to pay Rs. 1000/- per question to challenge the answer key. Fee payment can be done through debit/credit card. The final answer key will be released in the month of April 2019. For January exam, It has been released on 15th January 2019. Question: Are NIOS students eligible to apply for exam? Answer: Yes, they can also apply for JEE Main exam. Question: I have submitted the request for correction in Aadhaar Card. Should I apply with my old Aadhaar Number? Answer: Such candidates should fill the application by entering 14 digits Aadhaar Enrolment ID/UR No. (Including slash) printed on the slip issued by aadhaar centre after submitting correction request. Question: I made mistakes in my application. How can I correct it? Answer: NTA has provided a single time facility to make correction in the application form from 11th March 2019. Question: What has to be done if the Aadhaar details and my school record details do not match? Answer: If you have any issues in your Aadhaar Card you can apply from other ID proofs for JEE Main 2019 exam. Question: I belong to the Assam state. Which documents can I use to apply? Answer: You can apply for JEE Main 2019 through passport number, ration card number, bank account number or any other valid Government identity number. Question: How PIO/OCI & NRI candidates can apply without having Aadhaar Card? Answer: Such candidates can apply through passport details. Question: Is it compulsory to appear for both papers, i.e. paper 1 and paper 2? Answer: As paper 1 is for B.Tech and paper 2 for B.Arch. So, it is not necessary to appear in both papers, candidates can appear for the papers as per their choices. Question: What will happen if I have submitted more than one application form? Answer: At the time of issuing the admit card, both application of a candidate (which appear to be similar) will be merged and one admit card will be issued. Students should also send an e-mail mentioning both application numbers and specify the application number which they want to consider. Question: I have forgot to mention the name and date in the photograph. My application will be rejected or not? Answer: The application form will not be rejected in this case. Question: If I fail in one subject in 12th class exams in 2018, can I still apply? Answer: If you have failed in 12th class in 2018 and appearing in 2019, you are eligible to apply for JEE Main 2019. JEE Main 2019 admit card (April Exam) has been released on 20th March 2019. The admit card is available through online mode. Candidates can download their admit card through login. Successfully registered candidates are able to download the admit card via online mode. For April session, it is available from 20th March 2019. For January session, the admit card was provided on 17th December 2018. If you will work hard and study with a full dedication, then you can appear in JEE main and qualify it. No dear hard work doesn’t matter.if you do smart work then it is enough for you to qualify in jee. You can take help for JEE Main preparation with preparation tips, books & video lectures mentioned in our article – . .
Sir i have scored 45(ST) marks in jee main 2018 & i was eligible for jee advance but not success in it. Can i appear in both jee(main/advanced) next year.my 12th board marks is 60 percent after improvement. may i eligible for again improvement to get admission in IITs / NITs? Please help me. Not eligible for JEE Advanced. I have above 70% aggregate marks in all semester in Diploma in Electrical Engineering.I am a SC student.But I have 60% aggregate marks in chemistry in 1st+2nd semester.Am I eligible for getting admission in IIT for B.Tech in 2019 if I am final year student. Only eligible for JEE Mains. How it is possible because for admission in IIT/NIIT 75% is required! Then please sarvgyan told me whole concept about %. The whole criteria is given in the article. I want to ask that for example in first attempt I am able to clear jee main but failed to clear jee advance then next year am i able to give jee advance ? Do you mean- eligible only for apply in and not for admission? Sir I got 61% in hsc 2018 maharashtra board i am giving my improvement exam to get 75 % so I will be eligible for 2019 jee mains or not to get into NIT and IIIT ? Please comment. No, you cannot with this percentage of marks. Can participate in jee main but not in jee advanced. 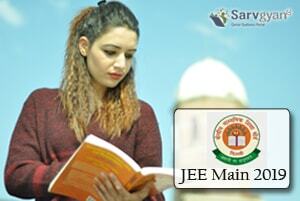 All the latest updates regarding JEE Main are mentioned in our article. Sir how much percentage we get in 12board to appear jee advance? I have scored 59% in PCM in 12th cbse board and I passed jee mains and advance. Can I take admn in IIT and NIIT. For admission in IIT and NIIT you should have 75% in your 12th class. Is it necessary to give improvement exam in all 5 subjects to get 75% … Or we can give few subjects improvement exams… In order to get admission in NIT and IIT. You can give in few subjects. You can apply for JEE main. Hi i failed in 12 th class in 2012 . Then i went to new zealand for studying cookery diploma and i got back from new zealand in 2016 after that i have gap . If i give my open board exams in 2019 in april . Can i apply for jee exams 2019 . My date of birth is 02-03-1995 .my age is 23 years . In this year i passed my 12th class with 62%.am i eligible for jee main 2019?and am i eligible for taking admissions in IIT? Can apply for JEE Main but not in JEE Advanced. I have ataind 96.28 percentile in board exams of 10th class. May I apply for jee mains now! You can apply in 12th class. What if i cleared mains but not advance.. where would i get admission…. And is there any criteria after clearing both the exams and getting the nearest iit institute or is it according to the rank??? Yes, you can take admission on the basis of both or one exam. I attempted first time in year 2017.it is also my 12passinging year.but in 2018 i van not apply for jee main.can i apply jee main in year 2019. In which month and which date Jee will be held in 2019?? Dates are available now, the JEE Main 2019 exam will be held twice in a year in January & April. sir,suppose I cleared jee mains but not advance. can I get admission in NIT……?? Sir i got 71% in class 12th 2018 am i eligible to give jee mains exam in 2019 without reappearing or improvment exam? Yes, you are eligible to apply in JEE Main 2019. Sir jee advance ke do paper hote hain. Usme 1st paper aur 2nd paper kis kis cheej ke hote hain. 2nd paper is for admission in B.Arch. If you have failed in Mathematics, then you can not apply for JEE Main 2019. Can I give betterment in one subject I.e biology ? I was absent in biology in 12 board exam ..
Sir i failed in class 12 in 2018 and applying again in 2019, how may times i can give Jee mains exam? If not secure minimum 75% marks in 12th exam. How can get an admissions to IITs, NITs, IIITs and CFTIs. In this case not eligible for these institutions. You have to give improvement in any number of subjects to increase your marks to be eligible for these institutions. May I attend only paper 1or I will have to attend both? You can attend only one. You can apply for JEE Main but not for Advanced. Yes, you can apply with some other document. Sir,is it compulsory to appear for both paper1 and paper2? Gave Class 12 boards in 2017, scored 72%, dropped a year, gave 12th exams this year and also JEE Mains. 12th result should be good but JEE Mains was a blunder(scored very low). Am I eligible for JEE 2019 if I gave improvement in only 3 subjects (Physics Chemistry Maths)? JEE main is for all engineering colleges and jee advanced for IIT, NIT. CFITs. What should be the minimum rank needed for any IIT. The cut off will be released later, till then you can get preference from previous year cut off. Sir,what is the cut off to appear in jee advance? Check previous year cut off marks for reference. Sir,good morning I want to know in 2019 jee main conducted by CBSE or nta ,if nta conduct jee main in 2019 is there will be change some pattern in question booklet? My birth date is 16 April 1994. can i apply for Jee main 2019? Am 12th pass out in 2017 what can I join jee mains 2019 exam..???? I appeared in JEE 2018 for first time and have also passed my 12th class in same year. How many times more i will be able to appear for JEE MAINS and ADVANCED…???? Please mention the years also..
Where the seal acceptance fees is to be paid ?? The last paragraph about counselling is not clear !! Pls could you clear me in detail about the whole. The official counselling notification is not released yet. The complete information will be released then. I am not clear that after jee main result we will go for counselling but that is online how to do that and how to know whether you have been selected in counselling or not and how to know ?? It will depend upon the JEE Main 2019 cut off marks. Not. It will be condcucted by CBSE. I haven’t previous year pepar set can you send me a last few years pepar of jee main and advance?? Get Jee main previous papers and their answer key from this link. For challenging the official answer key, a fee of Rs.1000 will be have to be paid. But if the challenge is verified and proved to be correct, the money must be refunded. This could perhaps enhance the belief people have on the examination board. Isn’t it possible? Its depend upon your 12th class passing year. i passed 12 th in 2018.then i joined integrated programmeca of iim,indore 5 years .then after can i give jee main & JEE ADVANCE.THAT TIME MY AGE WILL BE 22 YEAR.I BELONGS TO OPEN CATEGORY. cut off marks mentioned are out of 360 or out of 120 marks? The cut off will be prepared from total marks of JEE main. The photograph of father is necessary? Actually l have no photo of my father. He was died in 2000 . Each IIT has different courses. You can check by visiting each IIT. There is no such criteria. You should pass your 12th examination. For NITs and IITs you should secure atleast 75% marks. Marks obtain in class 12 should be aggregate 75%… Or 75% in each subject(pcm) separately?? Please reply as soon as possible.